The Indian government's policy on hybrid and electric vehicles has been marked by inconsistency and lack of clarity so far. 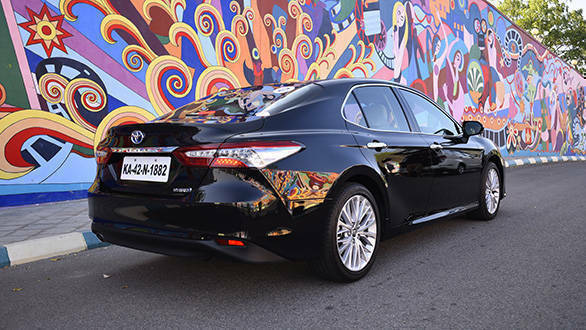 But having indicated that it intends to offer incentives for both, it appears that the winds of change are beginning to blow more forcefully with Toyota just launching the new eighth generation Camry with its latest fourth generation hybrid system, in India. This Camry is based on Toyota's New Global Architecture (TNGA) and as is now the norm with most new generation versions, it's longer (4,885 mm) and wider (1,840 mm) and also lower (1,455 mm) than its predecessor. It offers more space, especially in the boot as the nickel-metal-hydride batteries have been relocated under the rear seat for better space utilisation and sound insulation. The designers have also used a finely honed scalpel to shape the body, which not only has more substantial proportions and a wider and lower stance, but is sleeker and somewhat more dynamic looking too. The low and well sculpted bonnet and the sloping roofline makes the new Toyota Camry's shape appear more slippery and all the bright embellishments in the form of the chrome treatment on the doors and door handles, LED projector headlamps, day time running lights and front fog lamps makes it appear more premium. Between the headlights rests the familiar slim Toyota grille, but below it flowing into the bumper, is a much larger one with as many as seven slats culminating with a prominent lip spoiler. Honestly this looks quite ungainly to me and I think the slats will also be prone to collecting dirt and keeping them clean on our dusty roads may not be that easy. 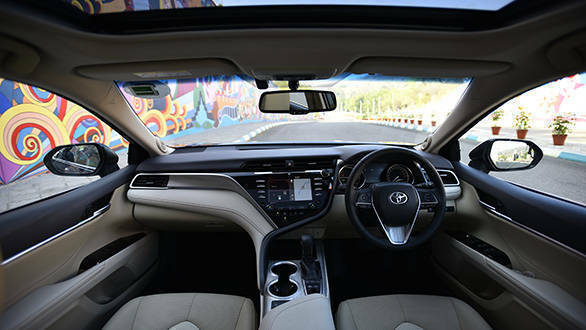 The new Toyota Camry Hybrid's cabin is spacious and airy and filled with materials that look rich and feel nice. Most surfaces have a soft texture and even the harder plastic bits, are not so prominent. The highlights are the electrically adjustable rear seats with power recline and boot access and the nine airbags. I also like the rear armrest with touch-control switches for rear recline, audio, rear sun shade and A/C settings. 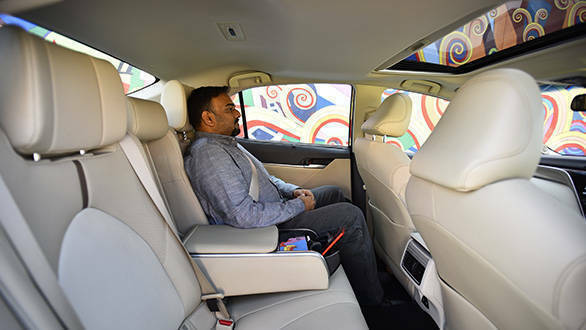 The front seats are wide and cushy and also ventilated, a useful feature in our hot summers. Both the driver and front passenger seats come with 10-way power adjust and lumbar support, making it convenient to find a comfortable seating position. Spending long hours in them should be easy and the new Toyota Camry has many other features like - a 10-inch heads-up display, wireless phone charger for compatible smart phones, an 8-inch multimedia touch screen with pinch-and-zoom navigation, tilt and slide sunroof (Toyota call it a moonroof), Bluetooth, parking assist, interior illumination package, tyre pressure monitoring system, etc. But instead of a conventional rpm meter, the Camry comes with one that displays eco or power driving styles and also provides information about the battery charging status. The heads-up display is easy to read and apart from the speed you can set it to show the engine rpm, a compass, navigation directions, etc. The interior design is simple (some may say boring) and recognisable as 'traditionally Toyota', but I rather like the semi-S shaped Onyx garnish  it does add a bit of flair and almost appears like someone signed off the design with it. This is where Toyota have done very well and the 4-cylinder, 2.5 litre petrol engine with improved combustion and some fine tuning tweaks, makes 178PS and 221Nm of torque. In addition the hybrid system electric motor delivers 120PS and 202Nm. 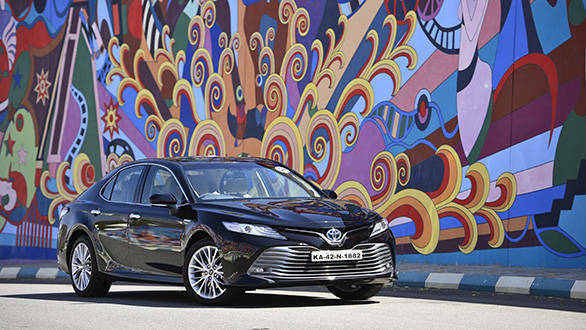 With both working in conjunction the maximum power is 218PS, which is more than adequate and makes the new Toyota Camry Hybrid a lively performer. The power is delivered in a linear manner and with the electric motor joining in; the torque is literally available on demand. Though we did not have an opportunity to put it through our proper timed tests, I think it will get from 0 to 100kmph in a little over 8 seconds. But what is more important I think, is the seamless and united manner in which both the petrol engine and electric motor function. They complement each other almost perfectly and the transition from one to the other is so smooth you can hardly tell which is doing what and when, even when both are working together. Of course at lower speeds and when the battery has sufficient charge, the Camry Hybrid glides along in purely electric mode in a most hushed manner. In fact, when you switch it on and it is idling with just the electric motor, the only way you can tell that it's running is by looking at the instruments. Toyota says that the fuel efficiency has improved too, and the Camry Hybrid's mileage is 23.27 kmpl as certified by our test agency under standard test conditions. In real life driving situations this should be around 16 to 18kmpl, which is very impressive too and what you would expect from a far smaller vehicle. The power is channeled through an automatic CVT (Constantly Variable Transmission) that also has sequential shift with paddle shifters. Though there is some of the rubberband effect associated with such gearboxes and when you push, it does allow the engine to rev high enough for it to get a bit vocal, it's still not as intrusive to be upsetting. The new architecture has made the Camry's body lot more rigid and along with the lower centre of gravity and new double wishbone suspension set-up at the rear, its driving dynamics are completely different. Gone is the floaty ride and the wallow, body-roll is now well controlled, the steering is more connected and communicative with further heft at higher speeds, that is confidence inspiring. There is a welcome tautness in the ride quality and while you may hear some of the deformities in the road, you scarcely feel them. 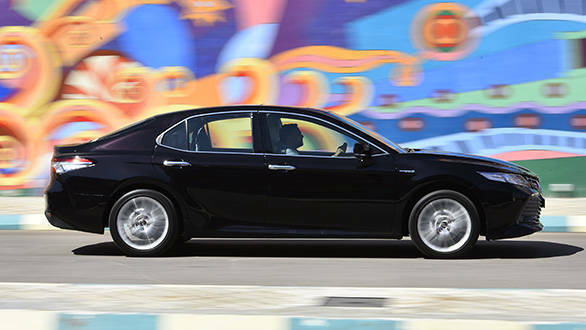 There is just no doubting the fact that the new Toyota Camry drives and performs far better now. It may not have transformed into a fully dedicated sports sedan, but the balance between ride comfort and driving pleasure cannot be faulted. The regenerative brakes are a revelation too, and offer good modulation and bite without making you aware that they are recovering energy and sending it to the batteries. It's only at slower speeds and in heavy traffic that they get a little grabby with the brake pedal responding differently to pressure. But to the credit of Toyota engineers, these brakes do their job of recapturing kinetic energy and converting it to electricity quite unobtrusively. 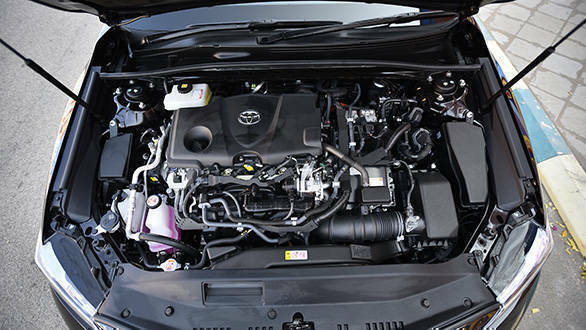 The overall NVH levels are first-rate and the Toyota Camry's new engine mounts and more extensive insulation measures have clearly paid-off. The driving modes like eco, sport and normal do change the performance characteristics fairly significantly and what I really like is that the lower bonnet and narrower A-pillar have resulted in far better frontal visibility. This reduces stress and allows one to manoeuvre the almost 5 metre Toyota Camry Hybrid more authoritatively. 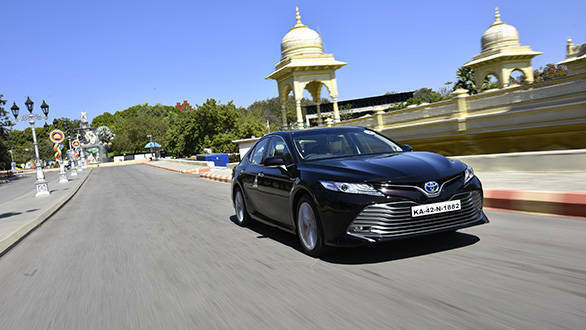 With an introductory price of Rs 36.95 lakhs (ex-showroom), Toyota is clearly looking at pushing the Camry aggressively. In my view, it's got a lot going for it and deserves serious consideration. What will certainly please most Indian customers is the fuel efficiency. And of course it drives well, has a very comfortable cabin, is loaded with useful features and its substantially fewer emissions and lower consumption of fossil fuel, also makes the Toyota Camry Hybrid, that much more environment friendly.